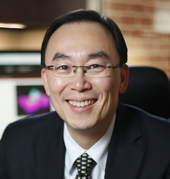 Yu Shyr, Ph.D., Harold L. Moses Professor of Cancer Research and director of the Vanderbilt Center for Quantitative Sciences, has been named chair of Vanderbilt’s Department of Biostatistics. He will assume the post Sept. 1. Shyr succeeds Frank Harrell Jr., Ph.D., professor of Biostatistics and founding chair of the department, who is stepping down after 14 years. As the new chair, Shyr will spearhead a department recognized internationally for its research and educational programs, with 33 full-time faculty, 20 staff biostatisticians and five computer analysts. The Department of Biostatistics interacts closely with a large number of departments and centers. The department also has an extensive graduate program that offers both Ph.D. and M.S. degrees with 36 graduate students currently enrolled. Harrell remains on the faculty full-time where he will be engaged in collaborative clinical research, teaching in the biostatistics and MSCI programs, and in a number of new initiatives. He is quarter time with the FDA Center for Drug Evaluation and Research Office of Biostatistics through an intergovernmental personnel agreement, as expert statistical advisor charged with fostering the use of innovative Bayesian clinical trial designs in drug development. He is partnering with Brad Malin, Ph.D., of the Department of Biomedical Informatics, in building a health data science center aligned with the learning health system, and leads the VICTR Trial Innovation Center study design core and the statistical center for the National Neurosurgery Quality and Outcomes Database Coordinating Center. “This has been a dream job in an incredible environment at Vanderbilt with gifted leaders and collaborators who gave our department every chance to succeed,” Harrell said. Shyr received his Ph.D. in Biostatistics from the University of Michigan and joined the Vanderbilt faculty in 1994. A professor of Biostatistics, Biomedical Informatics, Cancer Biology and Health Policy, he also serves as director of Vanderbilt Technologies for Advanced Genomics Analysis and Research Design and associate director for Quantitative Sciences Integration at Vanderbilt-Ingram Cancer Center (VICC). Shyr has shared his expertise across several disciplines. He is the founding director of the Vanderbilt Technologies for Advanced Genomics Analysis and Research Design (VANGARD). Developed in 2012, VANGARD consolidates genomics data pipelines across VUMC and allows investigators to leverage the capabilities of next-generation sequencing and other novel genomic technologies. “Biostatistics and data science will continue to be a critical foundation upon which the research enterprise advances discovery with appropriate rigor, validity and integrity,” said Robert Dittus, M.D., MPH, Executive Vice President for Public Health and Health Care and senior associate dean for Population Health Sciences. Shyr has participated in numerous research projects, assisted investigators in the development of research protocols and collaborated on multiple external peer-reviewed grants. He also has developed biostatistical and bioinformatic methodologies for the design of clinical trials and high-dimensional Omics data processing. Shyr’s research has focused on revolutionizing statistical bioinformatic methods for analyzing next-generation sequencing data. He is the principal investigator of the National Cancer Institute (NCI)-funded coordinating center for the Barrett’s Esophagus Translational Research Network (BETRNet), a multi-disciplinary, multi-institutional collaboration established to centralize and enhance efforts to reduce the incidence, morbidity, and mortality of esophageal cancer. He serves as the principal investigator of the NCI-funded coordinating center for small cell lung cancer (SCLC), a collaboration among investigators with the ultimate goal of reducing the impact of this disease. He also is an active collaborator and leader on research projects within VICC and across the VUMC campus. He is the Biostatistics and Bioinformatics Core leader of the NCI-funded Special Program of Research Excellence (SPORE) in both Breast Cancer and GI Cancer, and is the Quantitative Science Shared Resource (QSSR) leader of the NCI-funded Cancer Center Support Grant. Shyr has published more than 430 peer-reviewed papers in high-impact journals and is the associate editor of JAMA Oncology. He currently serves on 15 external advisory boards. In addition to his research efforts, Shyr is a renowned educator who has been honored with the Jacek Hawiger Award for Teaching Graduate Students and Postdoctoral Fellows in the Classroom, Lecture, or Small Group Setting, and was inducted into the Academy for Excellence in Teaching at VU. Shyr was chosen to lead the Department of Biostatistics following a national search. The committee was led by David Penson, M.D., MPH, Paul V. Hamilton M.D. and Virginia E. Howd Professor of Urologic Oncology and chair of the Department of Urologic Surgery. Other members of the search committee included Nancy Cox, Ph.D., Jesse Ehrenfeld, M.D., MPH, Melinda Buntin, Ph.D., Roland Eavey, M.D., S.M., E. Wesley Ely, M.D., MPH, Katherine Hartmann, M.D., Ph.D., Kristopher Preacher, Ph.D., Dan Roden, MDCM, Kevin Johnson, M.D., M.S., Vito Quaranta, M.D., Russell Rothman, M.D., MPP, Warren Sandberg, M.D., MPH, Steven Webber, MBChB, MRCP, Wei Zheng, M.D., Ph.D., Thomas Wang, M.D., and Consuelo Wilkins, M.D., MSCI.